OC Dermatology is 25 years old this year. March Madness! Botox- only $10 per unit all month long. Units may be pre-purchased in person or by phone for future use and never expire. Buy a Botox Club (package of 100 units) and receive a Free Beauty Bar Membership ($99 value)- see below for details. Due to Allergan price increases, Botox will be $14 per unit beginning 4/1/15. Stock up now. FREE SkinMedica Vitamin C&E Complex ($98 value!) with every SkinMedica Essential System purchase (2 Essential Serums plus free Retinol and Sunscreen). Limit 2 per person. Dr. Klein likes to pair Lytera Complex with her favorite procedures and products to lighten discolorations and melasma: SkinMedica Retinol Complex (included in the System), ColoreScience Even Up, SkinMedica Essential Serum, HydraFacial MD, Vitalize Peels, Clear+Brilliant and Photo-facials. 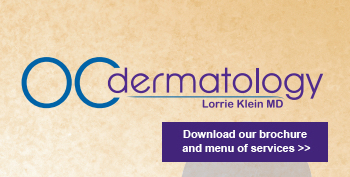 This month BBMD members receive 20% off SkinMedica Lytera Complex and the Lytera System. Stop by to learn more about Even Up by ColoreScience- a foundation, sunscreen and lightening product all-in-one! If you aren’t already, you too can take advantage of this awesome special by becoming a BBMD Member! Membership is only $99 per year and gives you 15% off all Beauty Bar MD purchases (except already discounted products) and 20% off our Staff Favorite Products of the month. You will also have access to special events and product promotions at Beauty Bar MD. Call us at 949-363-1788 (Dermatology), 949-495-4500 (Spa) or stop by to take advantage of these specials. OC Dermatology makes Top 50 3rd year in a row! What Is The Rejuvenize Peel?